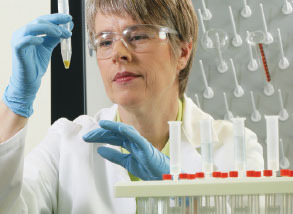 Ultrapure water is elemental to the success of your experiments. But finding the right water system for your research goes deeper than water quality alone. Choose from our portfolio of innovative ultrapure water systems, ideal for your most sensitive and critical analytical and life science applications. Gain flexibility in the lab with the Thermo Scientific™ Barnstead™ GenPure™ xCAD Plus Ultrapure Water Purification System. Its advanced technologies allow for simultaneous dispensing from up to three remote dispensers for ease of use in shared laboratory environments. This lab water system comes with leak detection, electronic dispensing for fully automatic volume control and feed water monitoring that alerts users to fluctuations in the feed water quality. Produce Type 1 ultrapure water while conserving space with the compact and flexible Thermo Scientific™ Barnstead™ GenPure™ Pro Water Purification System. Suitable for the most demanding laboratory applications, this system delivers 18.2 megohm-cm water with consistent quality. Gain flexibity with the dispenser that reaches up to 24″ (60cm) from the unit. It can be used on a laboratory bench or on a wall. Integrated feed water monitoring helps to maximize cartridge life. Produce Type 1 ultrapure water with consistent quality for your most demanding and sensitive applications with the Thermo Scientific™ Barnstead™ GenPure™ water purification system. This system offers outstanding control, high-precision and USP-complying conductivity measurement with temperature compensation that can be switched on or off. Process up to 15L/day of ultra-pure water with the compact and reliable Thermo Scientific™ Barnstead™ MicroPure™ Water Purification System. This system is an outstanding choice for applications such as HPLC or other instrumental analyses, sample preparation, glassware rinsing or molecular biology work in which endotoxins and/or nucleases would interfere. Stock high purity water safely and conveniently with the integrated 100L reservoir of the Thermo Scientific™ Barnstead™ LabTower™ EDI Water Purification System. This system combines purification with EDI technology and storage in one. Conveniently dispense Type 1 water directly from the system while Type 2 water is accessible from the reservoir, an ideal supply for lab equipment. Convert tap water to both ASTM Type 1 and Type 2 water with the compact, all-in-one Thermo Scientific™ Barnstead™ Smart2Pure™ Water Purification System. This complete system produces 3 or 6 liters of ultra-pure water per hour. The Smart2Pure 3 and 6 feature a built-in 6L reservoir to store the Type 2 water, while the Smart2Pure 12 offers the choice of a 30 or 60L reservoir for customizable storage capacity. Consistently delivering water purity of 18.2 MΩ.cm (Type I+/I) and underpinned by the advanced PureSure® deionization system, the PURELAB Chorus 1 enables you to focus on attaining accurate results while ensuring an uninterrupted work flow. The award-winning PURELAB flex 2 system provides perfect water purity for analytical and life science applications which require RO type III water up to ultrapure type I (18.2 MΩ.cm) water. It allows focus on routine test work without concern about the water quality affecting test results.